This tutorial shows the user how to add an event in the Squarespace Platform. While most of this tutorial is useful for the general public, it is in fact created specifically for the Veritas Classical Academy and its needs. 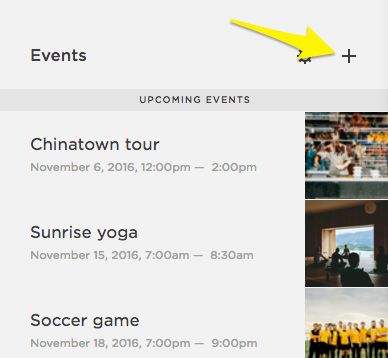 Add new events to your site on the Upcoming Events page located in the Not Linked section of the Pages menu. Add a description of the event in the Description box. It includes a Text Block to get you started. Add other blocks to create a custom layout for the event, just as you can do with any page or blogpost. Tip: To collect RSVPs or bookings for an event, add a Form Block or a block leading to a third-party booking service to the Description box. You can also add a Button Block to an external link if you use a third-party booking or event service. Add a category: You can use tags and categories to organize events. Information category propagates to specific information pages throughout the site. Click the Tags + or Categories + link to label your event. Formatting tips: Categories must be 25 characters or fewer and Tags and categories are case-sensitive. For example, entering Apples, apples, and APPLES creates three ta s or categories. Add an excerpt: Excerpts show visitors a short description of the event. To add an event excerpt, click the Options tab and add text to the Excerpt box. Set the event location: Click the Location tab to add an address for the event. When you start typing an address, the fields populate with a list of autocomplete suggestions powered by Google. This creates a pin on the map at that location. If you have connected accounts that allow for pushing content, you can automatically share the event on your social profiles when publishing it. From the Social tab, switch the share toggle to on for any accounts where you want to share this event. To learn more, visit Sharing content on social media. 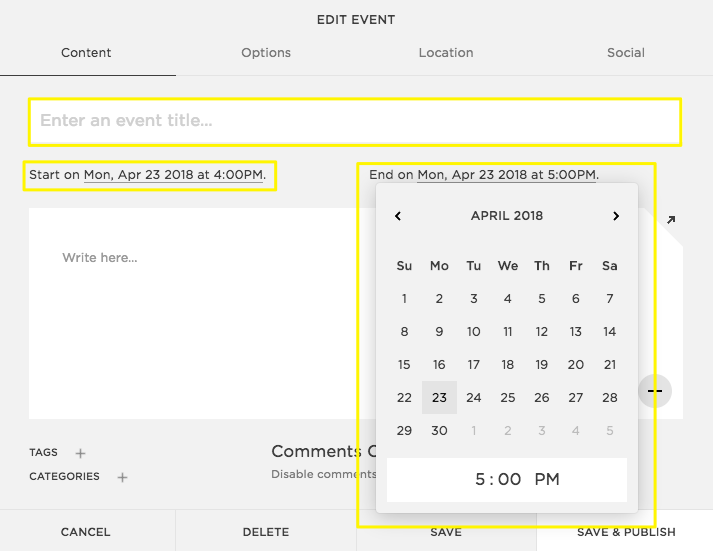 After creating an event, you can save it as a draft, or make it live immediately. Click Save to save your event as a Draft that's hidden from your live site. Click Save & Publish to close the editor, save the event, and make it visible on your live site. After saving the event, choose from four visibility options: Published, Scheduled, Needs Review, Draft. Scheduled, Needs Review, and Draft can be helpful if you want to upload content to your site but don’t want to make it immediately visible. To change any event's status, click the event thumbnail in the Events Page panel and then click Edit. From the editor, click the current status and select a new one. It's not currently possible to create recurring events, but you can duplicate events to create identical events without reentering the same information. Can I push events to my Facebook Brand page? You can push your events to your Brand page if it's connected in Connected Accounts. This shares the event from your site on Facebook, but it doesn't create an actual Facebook event. This video shows how we use the blog functionality to display a list of staff members with their bio and pictures. Enter the Staff name & title. Add some content regarding the staff member in the Text Block. Add other blocks if you want. Add an excerpt: This is very important because this is the information that actually displays with the staff picture in the site. You will want to add the FULL content here for Staff. Click the Options tab and add text to the Excerpt box. Add a Thumbnail: This is the staff picture that will show on the site. You can save it as a draft, or make it live immediately. Click Save to save your post as a Draft that's hidden from your live site. Click Save & Publish to close the editor, save the post, and make it visible on your live site. After saving the post, choose from four visibility options: Published, Scheduled, Needs Review, Draft. Scheduled, Needs Review, and Draft can be helpful if you want to upload content to your site but don’t want to make it immediately visible. To change any post status, click the post thumbnail in the Staff Page panel and then click Edit. From the editor, click the current status and select a new one. Add some content regarding the job/position in the Text Block. Add other blocks if you want, like a button to email you. Hover over the blocks in the Content area to get the black insert line. Click the insert drop to open the content menu. Either click on Button or search for Button to click on the menu item. Add button text - In the Text box, enter text for the button label. Tip: Keep the button text under 25 characters. Longer text can interfere with the button's design and may be cut off on narrower displays. Buttons are best when they use short text to encourage an action. For longer text, you can create a text link. Edit the button size - Select Large, Medium, or Small from the Size drop-down menu. Set the button alignment - Select Right, Left, or Center from the Alignment drop-down menu. Save - Click Apply to save your changes. You can use tags and categories to organize job openings. Click the Tags + or Categories + link to label your position. Formatting tips: Categories must be 25 characters or fewer and Tags and categories are case-sensitive. For example, entering Apples, apples, and APPLES creates three ta s or categories. Add an excerpt: This is very important because this is the information that actually displays under the position title in the site. Click the Options tab and add text to the Excerpt box. The school is Christ-centered. We partner with parents to instill excellence of character and fill our children with Godly wisdom. Children are with a trained, professional teacher in a classroom setting for 2 days a week. We follow an academically rigorous methodology that is based on the Trivium. Tuition for the Classical Core courses is approximately 40% of traditional private school. link color, normal text font and other styling.